o Immersive Gameplay & More: Experience the most authentic WWE gameplay ever, featuring thousands of new moves and animations, backstage and in-arena brawling, and the biggest roster of WWE and NXT Superstars and Legends to date. o Powerful Creation Suite: Create and develop your custom WWE with the deepest Creation Suite to date, featuring new creation options such as Create a Video, Create a Victory and a Highlight Replay system. New features and additional content allow you to create the most amazing custom Superstars, Arenas, and Championships. o MyCAREER and WWE Universe with New Promo Engine: The all-new Promo Engine brings the drama and personality of the WWE Superstars to life in MyCAREER and WWE Universe modes. Choose your words wisely and smack talk your opponents, start rivalries or form alliances. Your words will shape your characters as they rise through the ranks of NXT and WWE to become WWE Hall of Famers! Become a Paul Heyman Guy in a new subplot exclusive to WWE 2K17. o Soundtrack by Sean ""Diddy"" Combs aka ""Puff Daddy"": Enjoy a star-studded soundtrack featuring the top names in the music industry, such as Twenty One Pilots, French Montana and Black Sabbath, curated by Executive Soundtrack Producer Sean ""Diddy"" Combs aka ""Puff Daddy""! 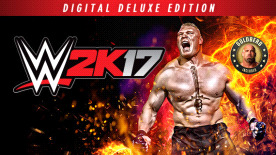 o WWE 2K17 MyPlayer Kick Start: Give your MyCareer Superstar the boost it needs with the WWE 2K17 MyPlayer Kick Start! Enhance your created Superstar’s journey through their career!  Earn a 50% boost in points earned for your MyCareer Superstar while in NXT!  Decide the overall rankings and attribute levels of every WWE Superstar and Legend in the game.  Unlock every WWE Superstar and Legend, including alternate attires with the Accelerator pack! • Legends Pack: Playable legends include Brutus “The Barber” Beefcake, Eddie Guerrero, Greg “The Hammer” Valentine, Sycho Sid, and Tatanka. • New Moves Pack: Over 50 new moves to add to your arsenal! Stun your opponents with the Swingout Neckbreaker like Charlotte, dive off the top rope with a Zack Ryder Elbro Drop, or give your opponent a Face Wash Combo like Samoa Joe. • Future Stars Pack: Play as 5 of WWE’s brightest new Superstars. The Future Stars pack features Austin Aries, Karl Anderson, Luke Gallows, Mojo Rawley, and Tye Dillinger. • Hall of Fame Showcase: Relive some of WWE’s most historic matches featuring the 2016 Hall of Fame Class and also get new playable characters, attires, and arenas! Matches include Sting vs Ric Flair (1988), Cactus Jack and Diamond Dallas Page vs. The Fabulous Freebirds (1992), Papa Shango vs. The Godfather, Big Boss Man vs. The Big Show, and much more.